When it comes to constructing an effective gate, you will find everything you need from our online store. We have a selection of products from fencing, gates and gate posts to suit all settings and budgets; our heavy duty gate posts are ideal for livestock and horses. Pressure treated for long lasting resilience, the redwood or oak timber gate posts from Farm & Country Supplies are sold in various lengths, and can be cut to suit your requirements. Popular because of their strength and stability, the timber gate posts from our online store are perfect for constructing sturdy gates for any environment. Incredibly strong and ideal for use in all weathers are our range of steel gate posts. 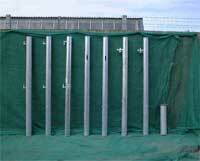 Available in differing lengths and diameters, these hang and slam gate posts provide a tough gate construction. Hooks can be ordered inverted for added security. Among our range of gate posts for all circumstances and uses, we also have accessories and tools for constructing your gate. Our timber gates include both Estate entrance gates with the dramatic raised curved end, or the traditional 5 bar field gate. Our steel gates include the heavy duty Fortress, mid weight Universal, Cattle yard Gates, Fully or half Meshed gates or even steel sheeted gates & doors. In sizes from 2' - 20' or custom made sizes, we can supply almost any gate in any size. Not only do we have a comprehensive range of gate posts, but you can also turn to us for a choice of gate furniture. No matter what your requirements are, we have everything you need to construct and maintain the ideal fencing and gates with our selection of gate posts and accessories. If you need any assistance with our gate posts, gates or fencing, please do contact us by calling our freephone number 0800 056 0002. We can assist with any questions that you may have, from the welfare of your livestock to advice on land management.